Participants in the Lambeth Digi-buddies scheme. In recent months, however, we’ve broadened our scope. In addition to thinking about digital inclusion in national terms - and how we most effectively reach the 10.5 million UK adults who currently lack the basic digital skills needed to make the most of being online - we’ve also turned our attention to what’s going on at a local level when it comes to digital inclusion activity. We know that there are a huge number of initiatives being led by organisations such as local authorities, local enterprise partnerships and housing associations up and down the country, and many of these go entirely unheralded. We want to showcase this activity and highlight best practice, not just to understand what makes certain initiatives so successful but also to think about how it can be replicated elsewhere. We’ve spent time speaking to a range of people with responsibility for digital inclusion at a local level to hear about their experiences in delivering successful digital inclusion programmes, including the challenges they faced, and this exploratory work is what underpins this post. Below are the first 2 factors of a 5 point ‘checklist’, setting out the main things that our interviewees highlighted as crucial to successful, sustainable digital inclusion activity. It’s only a starting point and the intention is that this will become a richer resource as we continue to hear from others. We also welcome any feedback on how this can be presented in a way that is more useful to those wishing to pick up the digital inclusion baton in their own locality. My next blog post will highlight the next 3 factors. Several local authorities pointed out the importance of knowing the scale and shape of the problem in the first place. That means understanding the digital exclusion picture amongst your citizens - particularly the barriers they face - in order to be able to target resources where they’re most needed. 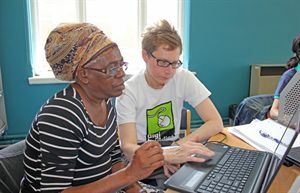 Southwark used their quarterly resident survey to understand how many people were not online. Initially, the survey simply asked whether respondents had access to the internet - 98% said yes. But they realised that this was misleading - what about those with household access but no personal skills/motivation/trust, for instance? They have now separated out access and skills, and January represented the first time that basic online skills questions were asked. This led the council to the finding that, of those people who don’t have skills, around 70% do have access. Lambeth Council conduct an annual residents’ survey and use this to guide their estimations as to what proportion of residents are digitally excluded. The most recent survey showed that 9% of Lambeth residents don’t have access to the internet, which constitutes about 30,000 people if extrapolated. The survey suggests that 47 are aged 65+, 42% have a disability, 35% not in job or training, 21% Black Caribbean, 16% are social renters. To reduce digital exclusion in the borough they launched Digi-buddies (see below). In Newcastle there is a long-term ambition to conduct some research into what proportion of people have no home access to the internet whatsoever, and also to think about what people perceive as being online/offline. The Council’s communications team have conducted some soft market research and this revealed, for example, that many people who use smartphones don’t perceive themselves to be ‘online’. The Council is keen to look at the impact that Newcastle’s lower levels of literacy has on people’s ability to get online (i.e. the relationship between low general literacy and low digital literacy). The council is running an ongoing piece of research which is seeking to better understand the level of digital confidence amongst frontline staff, as well as their awareness of the wider ambitions that the council has to equip people with basic digital skills. They are currently running a small pilot (about 25 people) looking at what staff barriers are, and what those of residents are (and the best ways in which to overcome these). Nearly all of those we spoke to talked about the value to be gained in not ‘going it alone’. There are a large number of organisations out there that are already doing great things where digital inclusion is concerned, and it makes sense to draw upon their experiences where relevant. DWP believe that the value of partnership working resides in allowing you to learn from what others are doing well, and identifying how it can be replicated. The department is in the process of twinning Barclays Digital Eagles with 12 business coaches and digital champions from Jobcentres in London and the Home Counties, Durham and Tees Valley and Benefit Centres in Derby, Sunderland and Chorlton. The plan is to encourage staff from the two organisations to work together to consider what activities can be conducted to increase the digital capability of DWP staff, who in the longer term can then in turn support customers more effectively. Barclays Digital Eagles have proven themselves able to find the hooks that motivate people of all age groups to want to develop their basic digital skills, whilst Age UK are leaders in their field when it comes to doing the same for older people specifically. It’s also important to remember that both government and cross-sector partners have the same customers. For their part, Bristol City Council quickly recognised that public and private sector organisations share many of the same concerns and challenges. If they’re unable to access 20% of the market due to the fact that many of their customers are digitally excluded, that’s an issue for them too. This pitches the partnerships approach as plain common sense. Bristol City Council has a strong focus on building the skills and confidence of its citizens. To this end, they worked closely with BT/Citizens Online as part of the national project Get IT Together. Through the programme the council offered a 5-week scheme (2 hours per week) to train people in basic digital skills. They were keen to avoid a mechanistic approach which simply teaches abstract skills out of context, but instead to find the ‘hook’ for each individual that would leave them wanting to develop their digital skills further thereafter. These included tracing family history, but also practical things like saving money through online shopping or enjoying hobbies and pastimes. They focused on older people, and particularly those with disabilities. In a similar vein, BT realised that when it comes to delivering an initiative that seeks to help a specific group within society, working in partnership with an organisation that has a strong reputation or brand can be invaluable. Internet safety is a significant priority for all of the main telecommunications providers, and BT is particularly keen to do something to help those who are likely to be most vulnerable when it comes to online threats - children. On the back of this, BT reached out to a range of potential partners - and selected UNICEF, with whose Rights Respecting Schools programme BT felt a great affinity as it dovetailed with their own approach. In conjunction with UNICEF, BT volunteers are now delivering an online safety programme called ‘The Right Click’ which aims to empower children to use the internet positively while staying safe, as well as to equip parents with the awareness, confidence and tools to keep their children protected online. BT put their volunteers through a comprehensive training package, before going out into schools and running a workshop. This looks at the risks associated with internet use and how to avoid them, such as how to set strong passwords and how to search safely online. The workshop is also geared towards parents, who are taught how to set parental controls and how to spot risks on the sorts of apps that their children use, such as Facebook, Twitter and Snapchat. The success of the programme is owed in no small part to working with an organisation that has real credibility amongst the target group - in this case schools and parents. See my next blog post for further success factors.